It was very much Missions Accomplished for Heath yesterday. 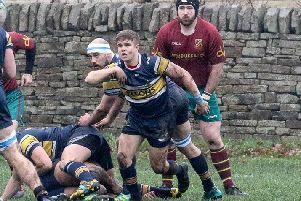 A 15-10 home win over Old Crossleyans not only gave them a full house of six Calderdale derby wins this season but also sealed a top two place behind Moortown. It is 16 years since United States President George W. Bush’s televised ‘Mission Accomplished speech’, which proved premature ahead of the Iraq conflict, and the North Dean club’s first team has spent most of the time since then in Yorkshire One. That could all change in a late-April promotion play-off game against the yet-to-be decided runners-up in Durham/Northumberland One, with ground advantage likely to be determined by this season’s home records. Heath have achieved coach Dave Harrison’s twin goals with two league games to spare but they were predictably made to sweat by Crocs in the warm spring sunshine. 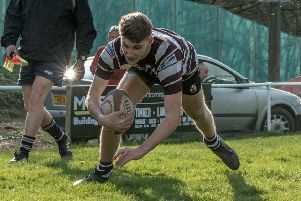 The first meeting had finished 18-14 to Heath at Broomfield in December and this clash of the second and fourth-placed sides was another highly-attritional affair. Heath generally looked the more likely winners but were unable to subdue their pumped-up visitors, who played the last 30 minutes with 14 men after centre Jack Hammond’s second yellow card following a spat with Chris Moore. While home front rower Moore was in the sin-bin, winger Josh Hunt’s length of the field try, converted by Callum Dunne, gave Crocs a 10-8 lead just before the hour mark. The home side muscled their way in front again, once restored to 15 men, through No 8 Richard Brown from an advancing five-metre scrum. Ezra Hinchliffe added the extras. Hinchliffe then missed a fairly easy penalty, which would have put more than a converted try between the sides, and Heath had to stand firm against a prolonged late assault from Crocs, led by indefatigable No 8 Ryan Hammond. Fifty three minutes after the start of the second half, the final whistle brought massive relief to the home supporters in a crowd of approaching 500. “Job done” was Harrison’s summary of a contest he felt had been very even. Heath, with doubles over Old Brodleians and Old Rishworthians already in the bag, had been boosted by the surprise return of flanker Jason Merrie from injury while Crocs had the adaptable Chris Vine filling in at No 10 for Joe Gallagher. Crocs have stiffened up their scrummage from earlier in the season but they struggled for lineout ball against Heath’s string of tall forwards. The visitors were the beneficiaries of several breakdown and scrum penalties from referee Andy Baker. It was stalemate until the end of the first quarter, when Crocs scrum half Joe Stott had an attempted clearance kick in his own 22 charged down and Heath gained a penalty which was converted by Hinchliffe. Jack Hammond was carded for a high tackle but Crocs responded strongly and when home scrum half Michael Reynolds was sent to the bin, Dunne knocked over a 35 metre penalty to make it 3-3 at the break. Heath started the second half well. Centre Issy Spooner was tackled into touch near the Crocs line and when towering Fergus Marsden picked off Crocs’ lineout throw, Merrie made it 8-3 from the driving maul. The home side tried to turn the screw after Jack Hammond’s dismissal, which came after the home contingent pointed out that the Crocs centre had already had one yellow card. Heath’s recent recruit Alex Patrick plunged over the try line wide on the right, but there had been a knock-on, and when a home pass went astray near the Crocs line, Hunt was away in a flash to help the visitors into a surprise lead. Dunne was short with a long-range penalty attempt before Hunt carried the ball back over his own try line and touched down when he had a chance to run back into the field of play. The now-dominant Heath set piece made Crocs pay for that error with what turned out to be the decisive score from the five-metre scrum.